A young 17 year old lady was shot in the chest and killed because a 20 year old male mishandled a handgun he shouldn't have had to begin with. It isn't crystal clear what happened at this point, but on June 17th, in Tulsa, Oklahoma, a 20 year old man apparently shot himself in the hand, and the same bullet traveled onward to hit the girl in the chest, killing her. To make this event even stranger, after the first shot was fired, another man apparently fell and shot himself in the leg through his pocket. Both men are expected to pull through, but the 20 year old, identified as Norris Williams, is a convicted felon with a previous assault and battery charge on a police officer and was not allowed to have a gun. At this time, both shots are being called an “accident,” as odd as that sounds. It's said at this time that Williams will be charged with manslaughter for the death of the minor girl. This is a sad story that could likely have been prevented, if the two mishandling the firearms had a better understanding of proper gun handling. Every weapon should always be loaded in our eyes, even if it is not actually loaded. Each time I pick a firearm up, I treat it like it's loaded. What does that look like? Well, the rest of the rules help out. But, just generally giving the firearm the respect it deserves, not fumbling around with it, etc., is treating it like it's loaded. Some folks I know change the wording of this one to say: every firearm is always loaded, even it if isn't. Don't point your gun at anything you're not willing to destroy. Well, he obviously pointed his gun at his hand because he put a round on that target. Sadly, he also killed a 17 year old lady. This rule was obviously not followed. This means that when you're at the range, your gun is always pointed down range at the targets. When you're in your house cleaning your guns, they're not pointed at something you can kill or destroy. Know your target and what's beyond it. So, hypothetically, let's say this moron's hand was his target. I'm not sure why it would be, but just go with me here for a sec. If his hand was his target, he obviously didn't realize that the girl was on the other side. That's a huge problem, and one of the biggest mistakes we see, here at Concealed Carry, when we analyze defensive gun uses. Listen, each time a round leaves the muzzle of your gun, you own it, and everything it touches. Even in a defensive gun use, you have to know your surroundings and not just pull the trigger blindly. Keep your finger straight and off the trigger until you're ready to fire. This is simple. If you keep your finger (and everything else for that matter) off the trigger until you want it to go bang, your gun won't fire. Can it get any simpler? This is a great spot for me to transition into my next thought about not shooting yourself in the leg. Mind boggling, isn't it? It's really that simple, though. If you have a gun in your pocket and you don't use a holster, you need to fix yourself immediately. Why? Well, because we don't want you to shoot yourself in the leg, like so many others have done. What's happening most times when you have a gun in your pocket, is that it's not in there tight like if it were on your hip or appendix. It moves around and isn't steady. Furthermore, when you “pocket” your gun when not in a holster, you have nothing to protect your trigger from a snag-pull. All in all, your trigger is open and waiting to be pulled or bumped by a table corner. Never, ever trust your gun's safety if so equipped. Safeties fail, and the best one is the one between your ears, anyway. Plus, a solid holster definitely doesn't hurt. Your brain tells you to follow the basic rules of firearms safety, and one of the best ways to follow those gun rules while the gun is not in your hand, is to have it in a holster while on your body. I pocket carry a small snubby revolver and a SIG P938 many times per week. Many concealed carry practitioners prefer this method of carry for the summer time, when it's “too hot” to carry a bigger gun. That's not my reasoning, but I can get into that in a future article. While nothing should ever be placed in your pocket with your gun, sometimes people forget it's in there, and end up giving their self-defense gun some company by putting their keys, phone, packs of gum, candy bars, cheeseburgers, knives, hands, and anything else that may fit in there. I strongly urge you to never put anything else in your pocket that your holstered gun is in as an added safety precaution. Also, don't fondle your gun, grip it, love on it, or anything else you'll be tempted to do. Leave it alone. Holster the gun outside of the pocket, and then stick the holstered gun into your pocket as an assembly. Never put the holster in the pocket and then fumble the gun into your holster and pocket. The main takeaway, is that your gun is smaller than your pocket and may move around. Having a holster minimizes how much it moves. Even more importantly, you need to make sure your trigger is fully covered and can not be manipulated by anything while in your pocket. When I say anything, I mean just that. If you stupidly put something in your pocket with your gun, bump into the corner of a table, or a kid reaches into your pocket for something, the trigger should not be easily pressed. 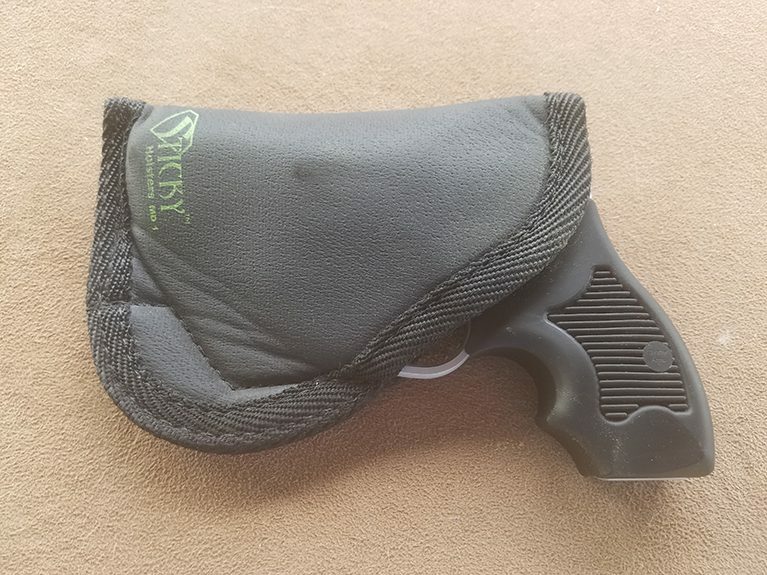 The pocket holster is an added step of protection for your gun's trigger. Having a proper holster in your pocket to protect your trigger is important, and cannot be overstated. Then again, following the basic rules for firearms safety also cannot be over emphasized. Pocket holsters are cheap and we provide the knowledge free of charge. Make sure you share this with whoever may benefit from it. Also, make sure you have liked our Facebook page so you can always see when we publish stories like this, and when we run sales on the things in our store.